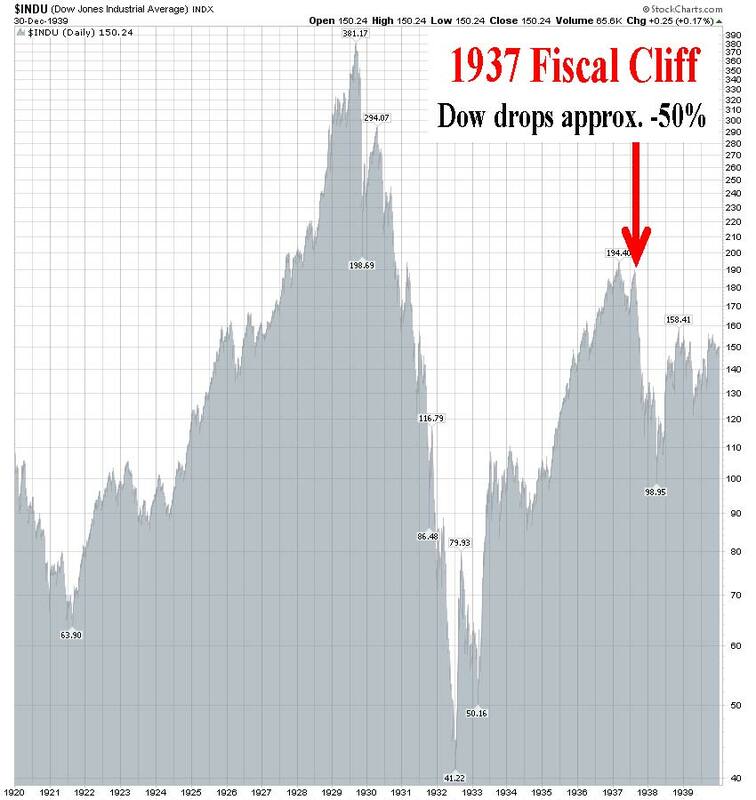 Fiscal Cliff: Will a 1937 Repeat = 2013 Dead Meat? The presidential election is upon us and markets around the globe are beginning to factor in the results. More importantly, in my view, will be the post-election results of the “fiscal cliff” discussions, which will determine whether $600 billion in automated spending cuts and tax increases will be triggered. Similar dynamics in 1937 existed when President FDR (Franklin Delano Roosevelt) felt pressure to balance the budget after his 1933 New Deal stimulus package began to rack up deficits and lose steam. Just as there is pressure to cut spending today by Republicans and “Tea-Party” Congressmen, so too there was pressure for FDR and the Federal Reserve in 1937 to unwind fiscal and monetary stimulus. At the time, FDR thought self-sustaining growth had been restored and there was a belief that the deficits would become a drag on expansion and a source of future inflation. What’s more, FDR’s Treasury Secretary, Henry Morgenthau, believed that continued economic growth was dependent on business confidence, which in turn was dependent on creating a balanced budget. History has a way of repeating itself, which explains why the issues faced in 1937 are eerily similar to today’s discussions. 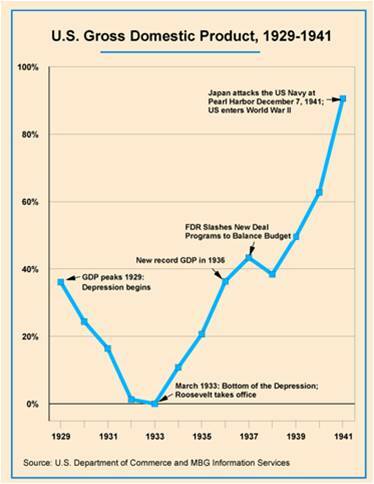 FDR was successful in dramatically reducing spending and significantly increasing taxes. Specifically, federal spending was reduced by -17% over two years and FDR’s introduction of a Social Security payroll tax contributed to federal revenues increasing by a whopping +72% over a similar timeframe. The good news was the federal deficit fell from -5.5% of GDP to -0.5%. The bad news was the economy went into a tail-spinning recession; the Dow crashed approximately -50%; and the unemployment rate burst higher by about +3.3% to +12.5%. 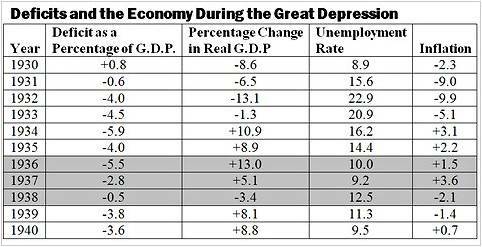 For starters, one difference between 1937 and 2012 is the level of unemployment. In 1937, unemployment was +14.3%, and today it is +8.1%. Objectively, today there could be higher percentage of the population “under-employed,” but nonetheless the job market was in worse shape back then and labor unions had much more power. Another major difference is the stance carried by the Fed. Today, Ben Bernanke and the Fed have made it crystal clear they are in no hurry to take away any of the monetary stimulus (see Hekicopter Ben QE3 article), until we have experienced a long-lasting, sustainable recovery. Back in early 1937, the Fed increased banks’ reserve requirements twice, doubling the requirement in less than a year, thereby contracting monetary supply drastically. Furthermore, we live in a much more globalized world. Today, central banks and governments around the world are doing their part to keep growth alive. Emerging markets are large enough now to move the needle and impact the growth of developed markets. For example, China, the #2 global superpower, continues to cut interest rates and has recently implemented a $158 billion infrastructure spending program. Whether you’re a Republican or Democrat, everyone generally agrees that job creation is an important common objective, which is consistent with growing our economy. The disagreement between parties stems from the differing opinions on what are the best ways of creating jobs. From my perch, the frame of the debate should be premised on what policies and incentives should be structured to increase competitiveness. Without competitiveness there are no jobs. At the end of the day, money and capital are agnostic. Cold hard cash migrates to the countries in which it is treated best. And where the money goes is where the jobs go. There is no single silver bullet to solve the competiveness concerns of the United States. Like baseball (since playoffs are quickly approaching), winning is not based solely on hitting, pitching, defense, or base-running. All of these facets and others are required to win. The same principles apply to our country’s competitiveness. Education: Chicago school unions have been in the news, and I have no problems with unions, if accountability can be structured in. Unfortunately, however, it is clear to me that for now our system is broken (a must see: Waiting for Superman). We cannot compete in the 21st century with an illiterate, uneducated workforce. Our colleges and universities are still top-notch, but as Bill Gates has stated, our elementary schools and high schools are “obsolete”. Entitlements: Social safety nets like Social Security and Medicare are critical, but unsustainable promises that explode our debt and deficits will not make us more competitive. Politicians may gain votes by making promises in the short-run, but when those promises can’t be delivered in the medium-run or long-run, then those votes will disappear quickly. The sworn guarantees made to the 76 million Baby Boomers now entering retirement are a disaster waiting to happen. Benefits need to be reduced and or criteria need to be adjusted (i.e., means-testing, increase age requirements). The problems are clear as day, so Americans cannot walk away from this sobering reality. Strategic Government Investment: – Government played a role in building our country’s railways, highways, and our military – a few strategic areas of our economy that have made our nation great. Thoughtful investments into areas like energy infrastructure (e.g., smart grid), internet infrastructure (e.g., higher speed super highway), and healthcare (e.g., human genome research) are a few examples of how jobs can be created while simultaneously increasing our global competitiveness. The great thing about strategic government investments is that government does NOT have to do all the heavy lifting. Rather than write all the checks and do all the job creation from Washington, government can implement these investments and create these jobs by providing incentives for the private sector. Strategic public-private partnerships can generate win-win results for government, businesses, and job seekers. If, however, you’re convinced that our government is more efficient than the private sector, then I highly encourage you to go visit your local DMV, post office, or VA to better appreciate the growth-sucking bureaucracy and inefficiency. Taxes / Regulations / Laws: Taxes come from profits, and businesses create profits. In order to have a strong and competitive government, we need strong and competitive businesses. Higher taxes, excessive regulations, and burdensome laws will not create stronger and more competitive businesses. I acknowledge that reckless neglect and consumer exploitation will not work either, but reasonable protections for consumers and businesses can be instituted without multi-thousand page regulations. Reducing ridiculous subsidies and loopholes, while tightening tax collection processes and punishing tax dodgers makes perfect sense…so why not do it? Politics are sharply polarized at both ends of the spectrum, but no matter who wins, our problems are not going away. We may or may not have a new president of the United States this November, but perhaps more important than the elections themselves will be the outcome of the “fiscal cliff” legislation (or lack thereof). If we want to maintain our economic power as the strongest in the world, solving this “fiscal cliff” is the key to improving our competiveness. Avoiding a messy 1937 (and 2011) political repeat will prevent us from becoming dead meat. Entry filed under: economy, Politics. Tags: 1937, debt, deficits, entitlements, FDR, fiscal cliff, infrastructure, investing, Politics, regulations, taxes, unemployment.